Explanation: This dramatic set of prominences looms beyond the edge of the sun. The image was captured by astrophotographer Bob Yen as he stood in the moon's shadow near Bagdere, Turkey on August 11 for the millennium's last total solar eclipse. Solar prominences consist of comparatively cool, dense ionized gas lofted above the sun's visible surface by intense magnetic fields. Prominences at the sun's edge or limb are easily seen during total solar eclipses when the moon precisely blocks the bright light from the sun's disk. 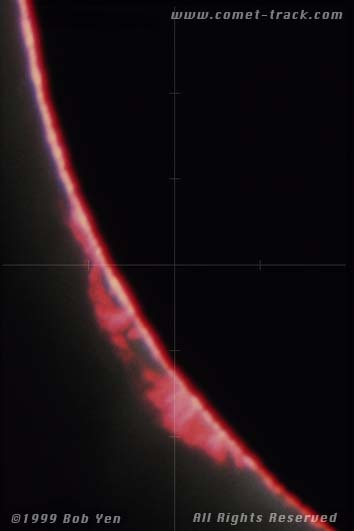 While many other prominences were reported during the August 11 eclipse, this particular image focuses on ones along the sun's southeastern limb.